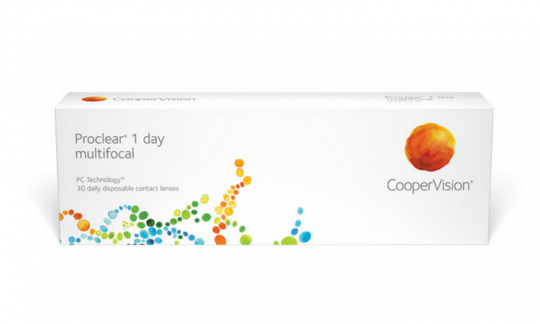 CooperVision Proclear® 1 Day Multifocal Contact Lenses (30 Pack) - A single use, daily disposable lens offering comfort, convenience and style. Whether you wear your lenses all day or only part of the day, Proclear 1 Day Multifocal contact lenses have unique PC Technology™ which provides a moist lens that stays hydrated througout the day, even after 12 hours of wear. Whether you live an active lifestyle or just want to enjoy the health benefits of fresh new lenses each day, Proclear 1 day multifocal provides you with options for part-time, occasional, or everyday wear.